OK, I must admit that when it came to choosing this week's beer, the glass chalice is what put it over the top. The Maredsous Gift Box comes with three abbey ales from Maredsous Abbey, a blonde, a brune and a tripel... oh yes, and a beautiful glass chalice. To do this properly, I tasted the beers in succession, starting with the light Blonde and working to the tripel, with a proper rinse of my new glass in between. This is the first time, though, that the beer of the week has taken two days to complete. 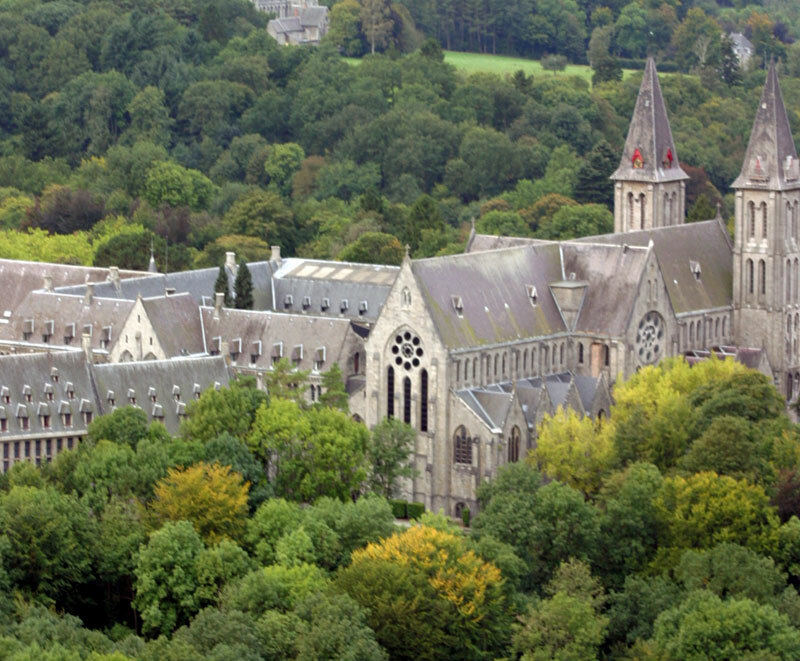 Maredsous Abbey is a Benedictine monastery in Belgium which was opened in 1872. 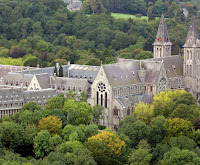 The monks of Maredsous are Benedictines who follow the thousand year old rule of life composed by St. Benedict who opened the first Benedictine monastery around 529. Abbeys provide food and drink for themselves. It seems brewing beer is always a part of any monastery and for good reason. In times of fasting, beer is the monks liquid bread. Maredsous makes an abbey ale. Abbey ale is a term associated with beer brewed by non-monastic types, frequently under such a license. In 1963, Moortgat brewery, which also produces Duvel, began brewing the beer under license from the monks of Maredsous using the original recipes. As it is brewed off site, it is considered an abbey ale. Profits are used to help the monastery and to fund charitable projects. Trappist and Abbey ales are types of beers are meant to be drank from a goblet or chalice in order to "enjoy the generous nose". Hey, I have the proper glass. Time for some tasting. Maredsous Blonde: This was the Abbey's very first beer. Their website says that the monks still drink this beer for lunch each day and logs in at 6% APV. The beer pours amber in colour and the head and lacings did not disappoint. I am a little stuffed and could not detect any aroma. I handed the glass to Teena and she, with her excellent sense of smell, could not detect any, although she too is a little stuffed. In the taste, though, the flavour really comes through. The list of ingredients on the bottle may state water, barley, malt, hops, sugar and yeast are involved. I am a little surprised at the sugar as it's the malt which usually provides the alcohol. I was also surprised about the spiciness in the beer. There are no outside spices added so this must come from the strain of yeast used. Excellent. Brune: Originally this was only made for Christmas but is now brewed year round. Good to know that I am drinking this during the proper season. It pours brown in colour with a nice head and decent lacings. Again not much in the way of aroma but more malt in taste than the blonde. There is a slight spiciness which must come from the yeast working with the malt, as there is no spice added. There is also a slight taste of alcohol in the taste. This is a nice beer but not a great beer. Tripel: This one used to be produced by the monks for special occasions. Today I had to miss my fencing tournament due to bad whether so in a way is a special occasion as usually on tournament day I am not home. Now it too is now brewed year round. This one pours coppery in colour. It has a nice head with lots of lacings on the glass. I can smell the alcohol in this one, not surprising as it weighs in at 10% APV. I can also smell spice and again there is no spice added to this one. The tripel is a little heavier in taste but quite similar to the Brune. Once again I get the sensation of spice and surprisingly ... very slight caramel?! Again, a nice beer but not a great beer. This gift set is a decent set to try. I had a wonderful blonde and two other nice beers and am left with a very nice chalice which I will use for winter warmers. If you have a chance to pick up a gift set for yourself or someone else, this would be a good one to get.